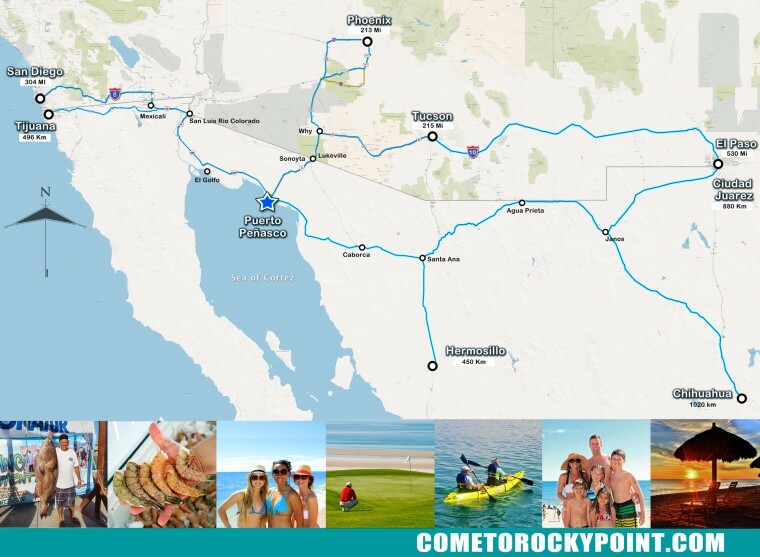 General location: Puerto Peñasco, also known as Rocky Point, is nestled in the northwestern corner of the Mexican state of Sonora, on Mexican highway #8 just 1 Hour (about 65 miles) from the Lukeville, AZ/ Plutarco Elias Calles (Sonoyta) border crossing. It is important to note the Lukeville/Sonoyta border entry is closed from midnight until 6 a.m.
From Phoenix: Heading West from Phoenix on I-10, take Exit 112 (Highway 85 South). Continue on Highway 85 through Gila Bend, Ajo, and Why, AZ to the Lukeville crossing. From the southern side of the Phoenix area, take AZ 347 S through Maricopa to AZ 84 W, and then I-8 toward Gila Bend/ San Diego. In Gila Bend, take Highway 85 South. Another option from Maricopa is AZ 238 to Gila Bend. From California and Southwestern AZ: Puerto Peñasco can now be easily reached along the new Coastal Highway 003. From the US/Mexico border near San Luis Rio Colorado, Sonora, take Mexico highway 2 east to highway 003 that leads to Santa Clara Gulf. From Santa Clara to Puerto Peñasco it is about 1½ hours. Note: Part of this section is a toll-road. IMPORTANT!! : As of June 1, 2009 a passport or passport card will be required for returning to the U.S. For additional information please visit (www.getyouhome.gov). Customs information about crossing into Mexico (Declarations entering Mexico).